So, about the header change…. Some of you involved in my day to day life have known I’m on the Weight Watchers train. I joined the Monday after my birthday and haven’t looked back. I was doing really well, losing every week (except one where I gained .2 of a pound) and was pretty happy with my results. Then I slacked off a bit, thinking I had figured out the system and thinking I knew how and when I could cheat. And then I had my weekly meeting last night. I gained 4.6 lb.s(!!!!!!!!!!!!) since the previous Monday. I was devasted, shocked, and really mad at myself. But I’ve been trying to put everything in perspective today–recommitting myself, going to the grocery store, and starting to count points again (which had petered off and was part of the reason I gained. Another reason may have been the Indian food and cheesesteak I ate over the weekend.). And part of the perspective is really how much weight I’ve lost already–27 lbs since my highest weight last summer (and if you think I’m going to put that number down, you crazy.). And a little more than 15 pounds since joining Weight Watchers less than three months ago. I wanted it to be more, but I’m trying to deal with why it hasn’t been. However, 27 lbs. is nothing to sneeze at (neither is 15 for that matter.). 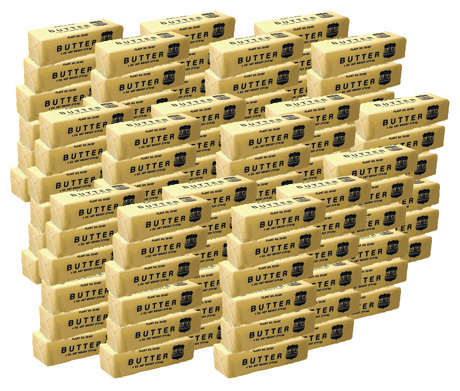 27 pounds is equivalent to 108 sticks of butter (the photo above is “only” 104 sticks of butter, btw). Or a 2 year old. So that helps me. Anyway, that’s the reason for my header change. « This is why I hate Justin Timberlake. It is such brutal work to diet…but nothing tastes as good as staying on track feels. Be kind to yourself…..we all fall off the wagon from time to time. I didn’t even know you HAD a 2-year-old!